A classic quesadilla is basically a corn tortilla with some melted cheese inside. But, as you know, you’ll often find quesadillas filled with chicken (pollo), potatoes (papas), chile poblano (rajas), mushrooms (champiñones), squash flower (flor de calabaza), chorizo, and even cecina (beef or pork). 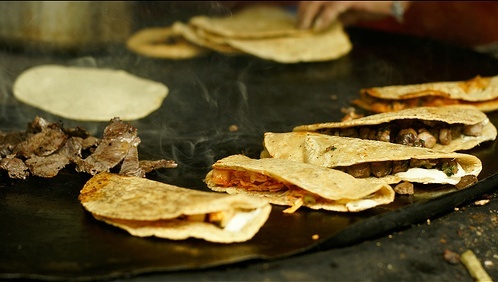 In Mexico, quesadillas are prepared on street corners throughout cities, at small stands under trees along winding streets and rural highways, in flea markets, and in small diners called “fondas”. Quesadillas are very popular, and people leaving work are frequently seen parking their cars at the first quesadilla stand they find and eating at least 2 or 3 deliciously hot quesadillas garnished with cream and salsa. Because they’re very light, they can be eaten for breakfast, lunch, or dinner. Place a skillet over medium-heat and add the oil. Once heated, place a tortilla in the skillet. Shred some cheese, and add the desired amount on top of the tortilla. Fold the tortilla in half, forming a half moon shape. When you see that the cheese is melting, flip the quesadilla over so the other side gets warm, too. This process should only take a minute or two. As soon as you see that the tortilla is getting crispy, remove it from the skillet and place it on a plate. Keep the quesadilla warm while you repeat the same process with the other tortillas. Add sour cream and salsa if desired. Remember, you can add whatever filling you want. So, along with the cheese, add mushrooms, rajas, chorizo with diced potatoes, or shredded chicken or beef. Enjoy! This entry is filed under Appetizers, Dinner, Quesadillas. You can follow any responses to this entry through the RSS 2.0 feed. You can leave a response, or trackback from your own site.